One of the most intriguing groups of crocodylomorphs to evolve and diversify through the Mesozoic was Thalattosuchia — a specialised group of longirostrine, marine-adapted crocodiles. 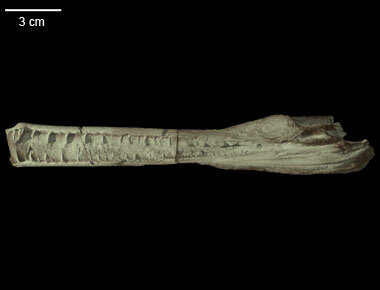 Thalattosuchia represents a monophyletic clade located within the broad group Mesoeucrocodylia and is characterised by an elongated rostrum, separation of the nasal from the premaxilla, reduced dermal armour, and a general reduction in the size of the fore limbs as compared to the hind limbs. Thalattosuchia is made up of two monophyletic families, the near-shore Teleosauridae and pelagic Metriorhynchidae, and one species, Pelagosaurus typus, whose phylogenetic affinity remains a point of contention. Pelagosaurus has been identified as belonging to both Teleosaruidae and Metriorhynchidae, and has also been placed as the sister group to both families. Unfortunately, since the initial description of Pelagosaurus in the late 1800’s few authors had examined its anatomy in any detail. The discovery of a collection of beautifully preserved Pelagosaurus typus specimens from the Ilminster succession of Upper Lias (Toarcian; Lower Jurassic) in Southern England provided a unique opportunity to present a thorough, modern, detailed anatomical description of the species. Through examining the Ilminster collection, Pierce and Benton (2006) found Pelagosaurus to contain a suite of apopomorphic features including: sculpturing on almost the entire skull and mandible with extensive sculpturing on the prefrontal, lachrymal, frontal, parietal, temporal arcade and the posterior extent of the mandible; 30 piercing teeth on each side of the upper and lower jaws; small, shallow, egg-shaped antorbital fenestra present within the lachrymal and maxilla; supratemporal fenestrae short anteroposteriorly; paired frontal; anterior margin of internal choana tapers anteriorly between the paired palatines; and presence of a choanal septum on the palatine and pterygoid. With respect to its phylogenetic affinity, Pelagosaurus was shown to possess the majority of teleosaurid apomorphies including: four premaxillary teeth; small prefrontal; lachrymal visible in dorsal aspect; presence of mandibular fenestrae; dermal armor; and a straight tail; however, these are all plesiomorphic for Crocodyliformes in general and thus do not unequivocally support a teleosaurid affinity. There also appeared to be problems when defining the proposed metriorhynchid features of Pelagosaurus (i.e., broad nasal, large frontal, lateral orbit, sclerotic ring and arrangement of prefrontal lachrymal) in that the definition of these characters is vague. Accordingly, Pierce and Benton (2006) considered Pelagosaurus to belong to Thalattosuchia incertae sedis until a proper cladistic evaluation was conducted. Intensive cladistic studies were subsequently run by Mueller-Töwe (2006) for Teleosauridae and Young (2006) and Gasparini et al. (2006) for Metriorhynchidae, with all three studies recovering Pelagosaurus as a teleosaurid. In light of this and other taxonomic problems with the group, Pierce et al. (in press) conducted a geometric morphometrics analysis of skull shape in Thalattosuchia in order to delineate species across the clade. The study found that the skull geometry of Pelagosaurus typus converged on the teleosaurid area of morphospace. Thus, based on the analysis of discrete morphological characters and skull shape patterns, Pelagosaurus currently appears to be a teleosaurid. This specimen (M1413) is the most complete Pelagosaurus typus skull on record. It is part of the Charles Moore collection at the BRLSI (Bath Royal Literary and Scientific Institute) which was discovered from Strawberry Bank (Upper Lias; Lower Jurassic), north of Ilminster, Somerset, England. This specimen was made available to the University of Texas High-Resolution X-ray CT Facility for scanning by Dr. Stephanie Pierce of the Royal Veterinary College, London. Funding was provided by a National Science Foundation Digital Libraries Initiative grant to Dr. Timothy Rowe of The University of Texas at Austin. The specimen was scanned in order to observe its internal anatomy and to assess its biomechanical performance using finite element modeling. 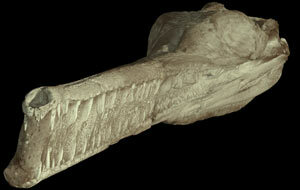 The specimen was scanned in two parts, the rostrum and the posterior skull, by Matthew Colbert on 9 August 2004. The rostrum was scanned along the coronal axis for a total of 960 slices, and the posterior portion also was scanned along the coronal axis for a total of 1110 slices. Each 1024x1024 pixel slice is 0.156 mm thick, with an interslice spacing of 0.156 mm and a field of reconstruction of 73.5 mm. Benton, M. J. and J. M. Clark. 1988. Archosaur phylogeny and the reslationships of the Crocodylia; pp. 295-338 in M. J. Benton (ed. ), The Phylogeny and Classification of the Tetrapods, vol. 1. Clarendon Press, Oxford. Clark, J. M. 1994. Patterns of evolution in Mesozoic Crocodyliformes; pp. 84-97 in N. C. Fraser and H.-D. Sues (eds. ), In the Shadow of the Dinosaurs. Cambridge University Press, Cambridge. Gasparini, Z., Pol, D., and L. A. Spalletti. 2006 An unusual marine crocodyliform from the Jurassic-Cretaceous Boundary of Patagonia. Science 311:70–73. Mueller-Töwe, I. J. 2006. Anatomy, phylogeny, and palaeoecology of the basal thalattosuchians (Mesoeucrocodylia) from the Liassic of Central Europe. Unpublished PhD thesis, Universität Mainz, Germany. 422 pp. Pierce, S. E. 2007. Morphospace occupation and mechanical performance in extant and extinct crocodile skulls: A combined geometric morphometrics and finite element modeling approach. Unpublished PhD thesis, University of Bristol, Enlgand. 285 pp. Pierce, S. E., and M. J. Benton. 2006. Pelagosaurus typus Bronn, 1841 (Mesoeucrocodylia: Thalattosuchia) from the Upper Lias (Toarcian, Lower Jurassic) of Somerset, England. Journal of Vertebrate Paleontology 26:621-625. Pierce, S. E., Angielczyk, K. D., and E. J. Rayfield. In press. Morphospace occupation in thalattosuchian crocodylomorphs: Skull shape variation, species delineation, and temporal patterns. Paleontology. Rowe, T., C. A. Brochu, and K. Kishi. 1999. Cranial Morphology of Alligator mississippiensis and phylogeny of Alligatoroidea. Society of Vertebrate Paleontology Memoir 6. Journal of Vertebrate Paleontology 19(supplement to 2). Young MT. 2006. Evolution and taxonomic revision of the Mesozoic marine crocodyliforms Metriorhynchidae, a phylogenetic and morphometric approach. Unpublished Masters thesis, Imperial College, University of London and the Natural History Museum, England. 140 pp. To cite this page: Dr. Stephanie Pierce, 2009, "Pelagosaurus typus" (On-line), Digital Morphology. Accessed April 25, 2019 at http://digimorph.org/specimens/Pelagosaurus_typus/whole/.